As seen in the March 1999 issue of Kitelife the internet magazine. As of 2005 I have updated the credits to include Charlie Sotich. Many of Charlie's great construction ideas are included in these plans. Minature kites have been around for a long time. In Japan at the new year kites are flown as wishes and the string is cut so wishes may come true. In China these kites are also made to represent dreams and problems and are flown to help resolve them. These minature kites are made of relatively delicate light materials. They can be flown outdoors but only in the lightest of winds. Mark the Cros spar at 1 1/2"
Mark the Bridle point at 2 1/2"
Use a very small drill to make holes at these points. If you don't feel comfortable heating/cooking the line you can always spend a little more on higher grade fishing line which contains much less curl in it. Using plastic template cut out skin from napkin using a cutting blade. With a pen or marker mark the of cross spar and bridle point on the sail. fold skin along the diagonal & make a crease. Mix some glue & water together. Thin the glue enough so it it not lumpy when you apply it to the paper. For thr spine, pull 25lb spar line through glue and place along fold in napkin. The spar should overlap on both ends. Don't worry about the excess line as you will trim it off after the glue is dry. For the cross spar pull the 15lb through glue and bend spar as shown in diagram. Ensure that the spar is on top of your cross spar mark you made with the template. Again cut ends off line after glue is dry. After the kite is dryed and trimmed you just use a a small piece of scotch tape to attach the the bridle line to the bridle point. The last step is to take two pieces of tinsel from 6 to 12 inches and attach with scotch tape to the end. When completed store the kite in a small plastic sandwich bag to protect it. one more napkin kite photo for you to view! Hold the end of the towing line with your fingers with the kite facing you. You may also tape the end of the towing line to a wooden rod or plastic straw. Raise your hand and slowly draw your arm across the air, allowing the kite to fly. In a larger space you can walk slowly around the room and pull the kite behind you With practice you may be able to perform a few tricks. You can join as many as you want into a train. I have seen up to seven flown successfully. If you hold a small wooden rod or straw in your hand and tie one end to to the fly line the kite train will fly with a lot less effort. You may have to move the bridle a little higher or a little lower in some cases This is a minature kite and therefore if the bridle is off just a little it will have more impact on how well the kite flys. If you find the kite is still not flying well remember to grab the spine and squeeze your fingers along the spine to form a curve in the sail. You have to form a dihedral to get the best performance. This plan took years for me to piece together. Various People such as, Skye Morrison and Merv Cooper, helped spread the fun of miniature kites to Canadians. Skye shared plans and philosophy from her visits to Japan and other world travels. It was Merv Cooper who first showed me how to create and assemble minature kites at a work shop back in 1994. Merv's miniature kites relied heavily on the plans of well known American, Charlie Sotich. Many of Charlie's great ideas are included in my plans. Charlie is one of the original developers of the miniature kite. One of Charlie's innovations was replacing bamboo spars with mono fishing line. He found it easier to use mono fishing line rather than trying to split bamboo into tiny spars. 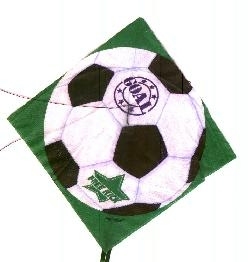 I was so fascinated with these kites that my whole family helped whip up 250 of them as party favours for my wedding in 1995. If you want to visit a fun website with tons of info pictures and plans visit my friend Glenn Davison and his Miniature kite website!